Earlier this year the BBC showed a 3-part series called ‘The Sound and the Fury’ charting the turbulent journey of classical music from the turn of the 20th century, its part in reflecting the events of the unfolding years of two world wars, and how it influenced, and was influenced by, popular culture, media and technologies. The programmes were fascinating, chronicling the shock unleashed on an unsuspecting public of Stravinsky’s ‘Le Sacre du Printemps’ in 1907 and the pioneering genius of Sibelius, Strauss, Mahler, Shostakovich and others. 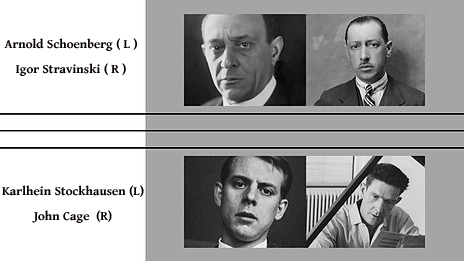 The real pistol shot, though, was fired with Schoenberg’s revolutionary atonal 12-tone regime, which was embraced to varying degrees by all the names listed above, and came to cast a spell over composers, well, für immer. The story goes on to explain that a fascination with American jazz artists like Duke Ellington, followed by Aaron Copland and Leonard Bernstein, played a major part in shaping composers Weill, Brecht and a host of others. This transcontinental pollination would, eventually, lead to the influence of mister nonconformist USA, John Cage, and a spiky autoroute to the avant-garde. A fierce ongoing debate about the true role of the artist, credibility, art versus entertainment, commercialism, selling out and so on rippled through the decades, reminiscent of the mud-slinging of Black Sabbath fans dissing patrons of Abba. Eventually Schoenberg’s atonal and fiery reign would loosen its grip allowing for a new classicism to emerge through the likes of minimalists Terry Riley, Steve Reich and others. By the time these new thinkers hit the scene they had enjoyed and absorbed the years of bebop jazz, rock’n’roll, and psychedelia to mirror back the path to the 21st century and beyond. 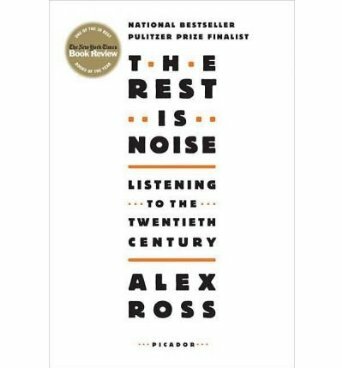 The documentary series was based on a book, published a few years ago, called ‘The Rest is Noise’ by Alex Ross, which I have just finished devouring – a hefty commitment, I kid you not, but well worth it. Any music lover, even if you come at this from the scrapyard of Psychobilly, Psychedelic Rock, 70’s Soul, and Pure Pop as I did, will crawl away a cleansed and mightier fan of sonic audio dust. Both telly programme and book come highly reccomendo. Get loinin’. 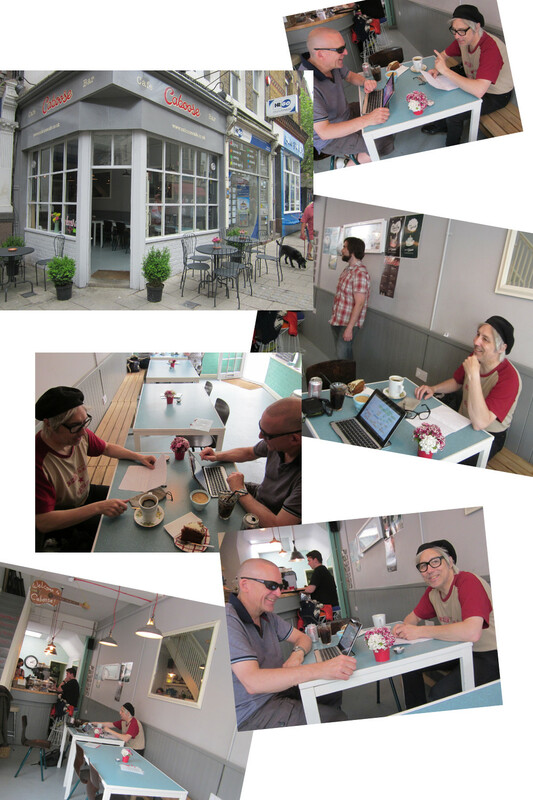 The Ramsgate Hovercraft recently paid a visit to one of our favourite café bars, Caboose, in Queen Street, Ramsgate in order to take stock of progress on the album and to plan for its completion. The good news is that we already have more than enough material for a double album, meaning that we will have some flexibility in choosing and arranging what goes on it and additional material maybe for bonus downloads or even to make a start on the next album. We identified a relatively small amount of work needed to finish a few tracks that are not quite complete and expect to have that work done in the next few weeks. That just leaves the practicalities of making a sleeve, getting the discs pressed, spreading the word and so on. We finished up feeling pretty positive about the whole project. Caboose is a top café bar, being small and friendly with good food and drink. There is often music in the evening, often featuring world-class musicians. Mike, the proprietor, is himself a working musician and is planning to open a recording studio nearby. It’s not just about mucking around with hovercraft – mainly what happens here is making music. So here’s an announcement: the album will be called Arcane Empire and it will be out later this year. It’s going to be a big fat double album on vinyl (but also available for download) in a beautiful gatefold sleeve. We’ve put together a short taste of what to expect, but keep watching for more teasers. where F is the sampling frequency and R and C are the values of the resistor and capacitor in the phase-shifting network (in our case having a time constant of 0.159ms). In the physical version there are two cascaded phase-shifters and equally the above digital filter has to be applied twice to one channel (the other channel is left unmodified). Because it is implemented as a simple IIR filter the digital version is extremely efficient and works very well – listen out for both the analogue and the digital versions on the album! You can find the source code here.